Total 4.8 amp output means you can charge two iPhone 7s at fast speed at once. It takes about about 10+ hours to recharge this powerbank using a 2 Amp wall charger. However, the newer Quickcharge version or the PowerCore II 20000 can be recharged in 4.5 hours. Update: The latest version – PowerCore Speed 20000 with QC 3.0 – comes with QuickCharge 3.0 (both Input and Output). The old version is still available if you do not have a QC 3.0 compatible phone (such as iPhones) and want to save some money. The newer version Anker PowerCore Speed 20000 QC can be charged in just 4.5 hours with a QuickCharge 3.0 Wall Charger. Anker PowerCore 20100 is Anker’s lowest cost 20100 mAH capacity equivalent USB power bank available in the market. This excellent power bank has a long, narrow and slim design that makes it very pocketable and portable. 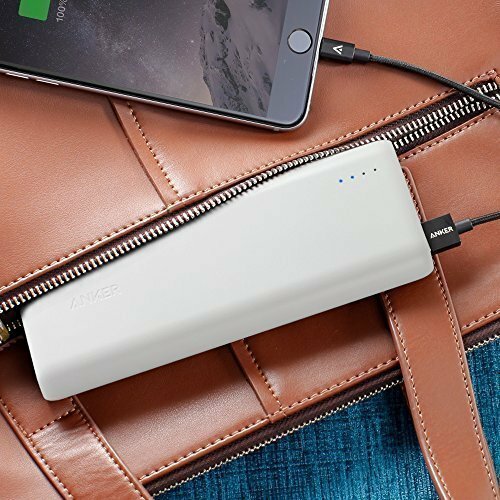 20,100 mAH is some serious battery capacity but the low weight (about 12 oz) of this mobile USB power bank makes it perfectly suited for your backpack, handbag or carry-on luggage. A standard fast charging 2 Amp wall charger such as Anker Elite dual 2.4 amp wall charger will charge Anker PowerCore 20100 overnight (about 10 hours). Regular 1 Amp USB charger will charge it in about 20 hours. PowerCore 20000 Speed QC (Shown on the left) is the newer version with both Quickcharge Input & Output . It gets charged in about 4.5 hrs using a Quickcharge 3.0 wall charger and charges your Quickcharge compatible smartphones to 80% in just 30 minutes. It has the exact same slim and long stylish design of the PowerCore 20000 including two USB ports (one Quickcharge port & one 2.4 Amp USB). PowerCore 20000 Speed QC is best option for QuickCharge 3.0 & Quickcharge 2.0 phones such as LG V30, Sony XZ1, Z2 Force, Nokia 8, etc. Here is a complete list of all QuickCharge compatible smartphones/tablets. PowerCore II 20000 supports QC 2.0 (18-watt fat charging – about 50% in 30 minutes), which is the fastest charging speed supported by Samsung S9, S9+, S8, S8+, Note 8, S7, S7+, Note 5, S6 etc. It does not support QC 3.0. PowerCore II 20000 is best option for latest Samsung smartphones including S9, S8, S7 etc. Anker PowerCore+ 20100 USB-C – (Shown on the left) is the version with one USB-C port and and two USB charging ports instead of the two ports in this version. The Anker PowerCore+ 20100 USB-C is priced higher than this version and the one extra port is an USB-Type C port which can charge/run latest 2016+ Macbooks as well as many modern ultrabooks and chromebooks at 15-watt charging speed. However, this model is practically obsolete and overpriced for 2018 as it does not offer USB Power Delivery (PD) charging over the USB C port. We instead recommend Anker’s latest USB C powerbank PowerCore 20000 Speed PD. Both Google and Apple are both moving towards 18-watt USB-C PD fast charging in latest and upcoming Android phones and iPhones as well as Macbooks. If you have a Macbook, and latest iPhone XS Max, XS, XR, 8, 8 +, or iPhone X, or an Android USB-C phone such as Samsung S9, S8, Note 8, S7 etc., we recommend Anker PowerCore 20000 Speed PD which supports 18-watt USB C PD fast charging (50% in 30 minutes) for the latest iPhones and Android smartphones. Anker PowerCore 20000 Speed PD comes with a bundled USB PD wall charger and gets charged in 4 hours. It will also charge Macbooks at faster 24 watt charging speed. The combined wall charger/powerbank deal of PowerCore 20000 Speed PD is also much more reasonably priced as well. PowerCore 20000 Speed PD will also charge Nintendo Switch at maximum supported 18-watt PD charging speed. PowerCore 20000 Speed PD is the most versatile Anker Powerbank today in the 20000 mAH range and it is the best option for latest iPhone X, 8, 8+, all latest Android phones including S9, S8, S7, Macbooks, Switch etc. 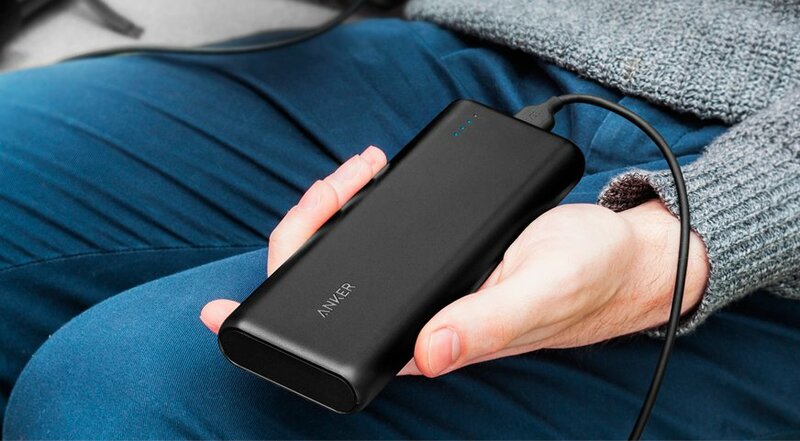 Anker PowerCore 20100 is the lightest version with no Quickcharge and also costs the lowest. 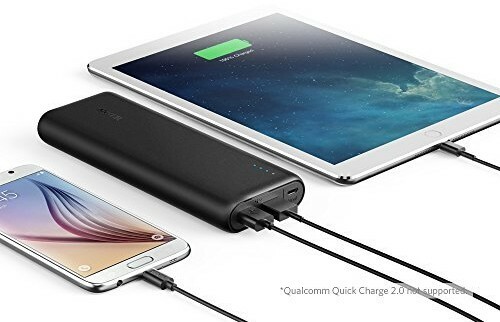 It is an excellent choice as a large capacity reasonably priced powerbank for both Android and iPhones if you do not need Quickcharge. It is the best bet if you plan to just charge iPhones 7, 6S or older (iPhones 7 and older do not support Quickcharge or fast charge) as it charges iPhones at maximum possible 2.4 Amp (i.e. 12 watt output) charging current. 12 watt is pretty decent charging speed for even the latest Quickcharge supporting Android phones and for most phones it provides about 40%-50% charge in 45 minutes. Anker PowerCore 20100 battery bank has to be one of the best looking high capacity power banks in the market. It comes in two matte colors – black and a very cool looking white – with four blue LED indicators. The matte finish ensures that the outer surface remains fingerprint free and looks subtly beautiful as well. This powerbank has a dual layer design. The inner metal shell provides protection and ruggedness while the outer polycarbonate layer ensures a smooth outer surface that does not scratch other items in your bag. 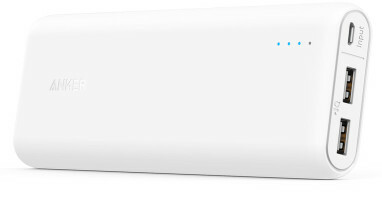 True to Anker’s reputation, the Anker PowerCore 20100 battery bank also offers true 20,000 mAH capacity which means that you can charge most smartphones about 5-6 times with this powerbank. The powerbank uses very high quality 6 Panasonic 18650 3400 mAH NCR18650B batteries which are one of the highest quality batteries available in the market. The high qualities batteries are reassuring and promise long life and safety. Anker PowerCore 20100 USB battery bank comes with two 2.4 amp fast charging ports. 2.4 amp is the fastest charging ports that you will currently get in the market and with both ports delivering 2.4 amp current, you do not have to worry about remembering the fast charging port. Latest Update: Anker now offers a version of PowerCore 20000 with QC 3.0 – for superquick charging. The new version can charge compatible devices up to 80% in just half an hour. It also gets fully charged using a QuickCharge 3.0 Wall Charger in just 3.5 hours. Here is a complete list of QuickCharge compatible smartphones/tablets. Please note that iPhones 7 and older do not support quickcharge but instead support 2.4 amp fast charging supported by Anker PowerCore 20100. Anker PowerCore 20100 external battery bank comes with 10 safety protections ranging from surge protection and over voltage protection to temperature control and output current limiting cut-off. While most of these are available in all quality external battery banks, one feature that we will like to mention here is the Voltage Boost feature. Anker claims that the voltage boost feature senses the resistance of the cable and increase current accordingly. This feature is important when you are charging your device using long cables as such cables have high resistance that wastes current and leads to slower charging. While we always recommend users to use shorter and high quality cables as they make your powerbank charge last longer and charge your device faster, Anker Voltage Boost feature atleast takes care of one of these issues by increasing current to charge your device faster. However, please note that as increased current will drain your power bank faster too, the best option is still to use a high quality and very short cable to extract maximum power from your power bank and reduce wastage of stored power. I have damaged a couple of cables – don’t ask me how – which are used to charge up my Anker PowerCore 26800. I am not clear which cables to buy to replace them (they are the two black short cables supplied with the device) – is there any difference between the USB – C to mini connections for various phones and the USB – C to mini connection to recharge the battery itself. What precise terminology do I use when reordering cables? Hope you can help.